Non-delivered orders bring with them unnecessary logistics costs and present a risk for service level. Non-Deliveries Tracking Tool provides automated continuous tracking and evaluation of non-deliveries, whatever their reason. Our client ships goods to a large number of B2B customers and every day a certain part of orders is not delievred. It is important for the client to monitor non-deliveries and their reasons and to continually evaluate the situation. 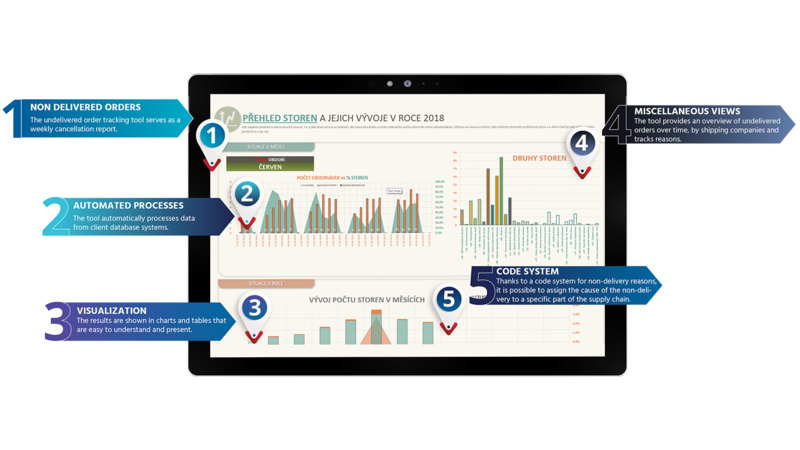 Non-Deliveries Tracking Tool allows him to get a quick overview and evaluate non-deliveries based on a number of criteria. Two sets of data enter the Non-Deliveries Tracking Tool. The first one comes from the client’s database system and is related to scheduled deliveries to customers, i. e. what transportation company carries what goods to what customers. The second set of data comes from client´s shipment planning software and contains data about undelivered orders. The client has a system of reason codes for non-deliveries in which each reason refers to one of the processes in supply chain. The tool automatically performs a series of calculations and converts raw data into reports. In the overview section the user can see the total number of non-deliveries compared to the total number of orders in indvidual weeks and months. 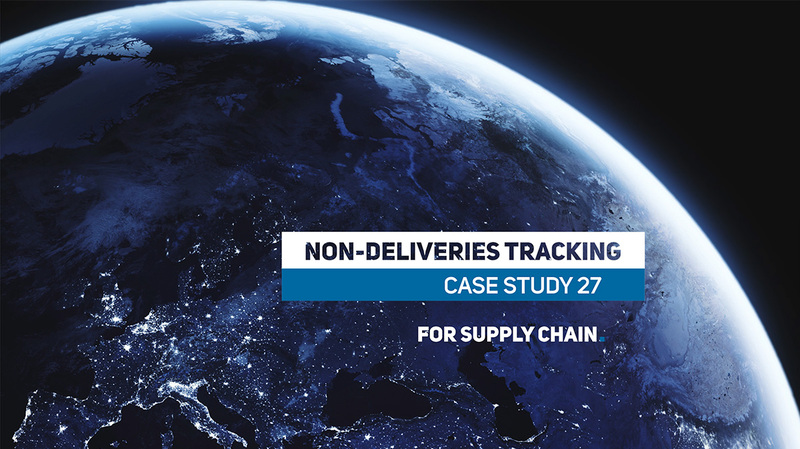 Furthermore, there is an overview of non-deliveries according to the reasons, which makes it possible to trace the most common reasons and to optimize the relevant part of the supply chain accordingly. Overview of non-deliveries sorted by logistics channels and by transportation companies then allows the user to watch performance of individual carriers and take action in case there is a problem. Thanks to sophisticated algorithms the report processes the input data in a very short time. It displays the results in a well-arranged interface that is user-friendly and easy-to-read. The client updates the report on a weekly basis and also evaluates the results on a weekly basis. The development of Non-Deliveries Tracking Tool was gradual. In the first version the data on non-deliveries was entered manually. The latest version is automated and linked to data from the shipment planning software. We have developed hundreds of tools that track different types of indicators and automate processes in daily operations in supply chains. We can mention, for example, Day-to-Day KPI Summary in Logistics or the Goods Arrivals Advice Online Application.